Names: Oval-leaved Blueberry is also known as Oval-leaved or Black Huckleberry or Early Blueberry. Ovalifolium means oval-leaved. Distribution: This species is found from southern Alaska to Oregon in the west, including the Idaho Panhandle and Montana. In the eastern United States it is found only in Upper Michigan. 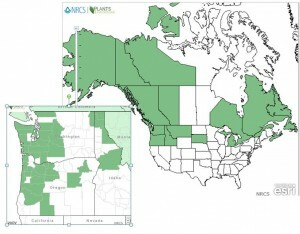 It is found in all the Canadian provinces and territories, excluding Saskatchewan, Manitoba and the Nunavut Territory. It is also found stretching across much of the Pacific Rim from the Aleutians to Japan and parts of the eastern mainland of Asia. 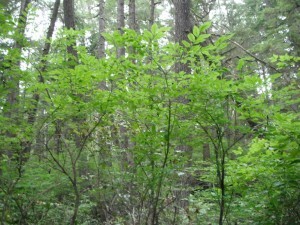 Growth: Oval-leaved Blueberry grows from 3-9ft. (1-3m), and grows a maximum of 12 inches (30cm) a year. Habitat: It grows in open forests, clearings and bogs, preferring moist soils; from sea-level to the timberline. Plants in arctic and subarctic zones are often low and broom-like; repeated browsing produces the same effect. Wetland designation: UPL, Obligate Upland, it occurs in wetlands in other regions but almost always occurs in non-wetlands in the northwest. Diagnostic Characters: The young twigs of Oval-leaved Blueberry are brownish or reddish to yellowish, angled and grooved. Flowers are urn-shaped and pink; they usually appear before or with the oval-shaped leaves. Berries are blue-black with a bluish bloom—very much like commercial blueberries. 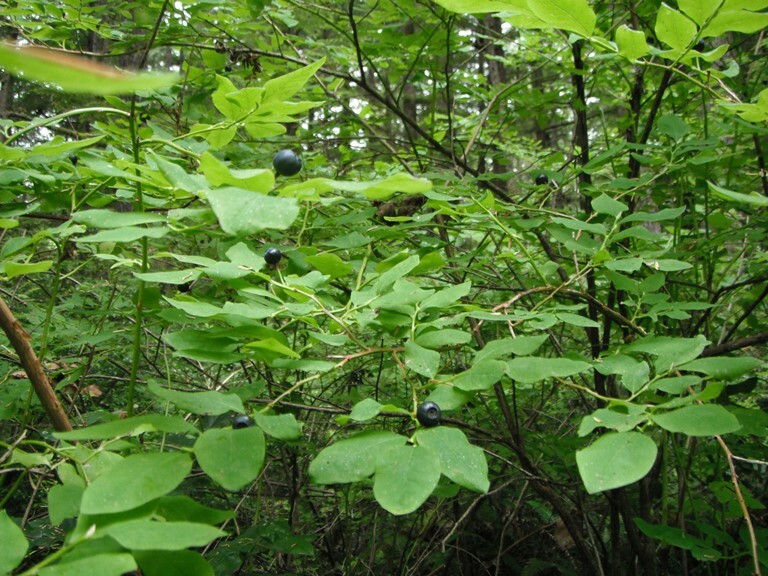 In the Landscape: Oval-Leaved Blueberry is attractive in a woodland garden, especially when grown along with Red Huckleberry. Their similar architecture and foliage shapes create an enchanting visual harmony; their berries, contrasting, blue vs. red. Phenology: Bloom time: April-July; Fruit ripens: June-August. Propagation: Oval-leaf Huckleberry regenerates naturally by sprouting from basal buds and rhizomes. Seeds germinate best when exposed to warm temperatures (~15 days), then cold temperatures (~15 days). Germination is typically between 50-60%, but may be over 90% under optimal conditions. Division, layering and cuttings are also possible. 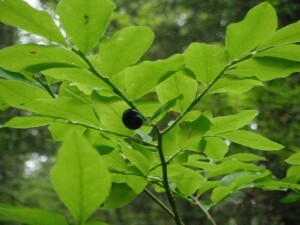 Use by People: Natives ate the tart, flavorful berries fresh, dried, or mixed with oil or oolichan grease. The berries also make excellent jelly or wine. 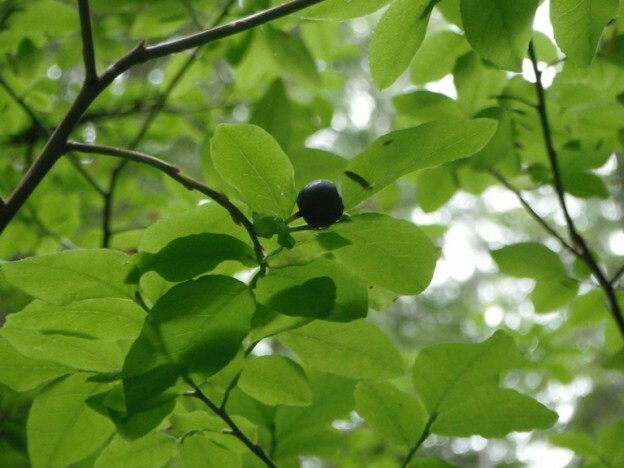 Use by Wildlife: As with other huckleberries, Oval-leaved Blueberry is an important food for both Black and Grizzly Bears. 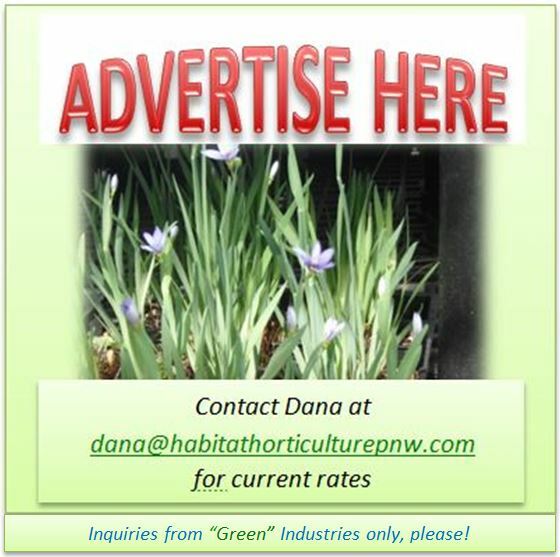 This entry was posted in Deciduous Shrubs & Vines on February 22, 2016 by habitatdana.